Preheat oven to 400’F. Line a large baking sheet with parchment paper. Wash and scrub delicate squash. Cut off both ends, cut down the center (the long way) and scoop out seeds and stringy bits. Then slice squash into half circles about 1/4 – 1/2 inches thick. For basic recipe, in a large bowl, drizzle in 1 tablespoons of fat of choice and salt to taste. If going for a flavored version, add whatever flavor combo ingredients that you like to the fat and salt. Mix to thoroughly coat. 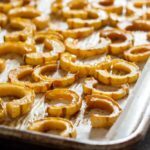 Spread squash pieces in a single layer on prepared baking sheet and roast for 20 minutes. Flip squash with a spatula and roast another 15-20 minutes, until fork tender and golden brown. Serve and enjoy! !